It happens early in “Dartman,” Bang!‘s opening track. Bobby Previte‘s brisk drumming kicks in, and we’re transported back to 1990, back to the days when the Knitting Factory meant something, with carefree horn/violin unison lines shaping that downtown style of jazz writing. That airy violin sound, adding space to the melody — that’s Mark Feldman! There — there’s the tight curl of Herb Robertson‘s trumpet! That fast, crunchy electric bass that just has to belong to Percy Jones! It’s like being the jazz equivalent of a Star Trek convention newbie. So much to point at! 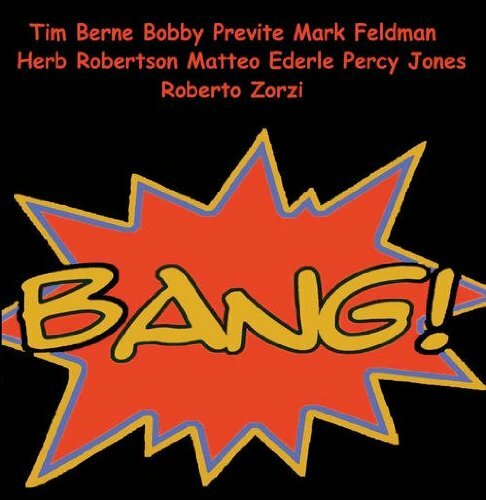 And that’s without even mentioning Tim Berne! They’ve all convened at the behest of Roberto Zorzi, a guitarist who today is less well known and less well recorded than his sidemen. This is his septet, apparently called The Bang, which played at the Rocella Jonica Jazz Festival (Italy, I’m guessing?) in 1990 and released an album the following year. It’s now getting a new life on Ictus, and we’re the richer for it. Yes, there are plenty of other CDs featuring these players from that period, but if you haven’t listened to any of them for a while, as was my case, this album sends the nostalgia flooding back. A smattering of band photos inside shows the players 20 years ago — could it be that distant? — Previte, Berne, and especially Feldman looking so young. What a time it was, and what a band. You can hear elements of each player’s style in the mix, but the one who stood out the most for me was Feldman. He seems to get the biggest share of front-and-center time, often on electrified violin. Jones’ bass stands out, too. It’s always there, fidgeting restlessly under the currents. And Zorzi? He’s not trying to be an enigma, but he’ll have to understand if American listeners like me haven’t chanced upon his music before. Plenty of information is on his web site, and sound samples, too. And you have to look for them, but his recordings are around, here and there. You can quibble about the recording itself — the applause cuts in or out abruptly, and there are some big volume swings in Robertson’s trumpet (probably a function of him wiggling around next to the mic while playing.) But the five tracks here display some terrific playing, compelling compositional suites, and a group-mindedness that allows for intimate solo or duo segments. It all ends with “Calma e Gesso,” a sparse track rich in those soloing spaces. Best of all? I got my copy at Amoeba SF, finding it through good old-fashioned browsing. Bang! is one of those unearthed treasures that make music shopping fun. And for Ictus owner Andrea Centazzo, I’ll bet it makes owning a label fun, too. September 23 is John Coltrane’s birthday, right? I figured I could make it easier on myself by celebrating Coltrane’s birthday with a couple of long tracks and an album I’d picked up a couple of years ago: Live in France, July 27/28, 1965, a two-CD set on Gambit Records. All the jazz greats have scads of random, piecemeal albums in their names — live sessions, “best-of” compilations, that sort of thing. The reason I bought this one: It’s got “Ascension” on it, twice. Played by just the classic quartet (Coltrane, Tyner, Garrison, Jones), not the full, screaming version. It was too much to resist. And you know what? Pared down, “Ascension” comes across like a normal Coltrane song. The solo has its overblowing and dissonance, but it feels more polished. McCoy Tyner’s piano, eclipsed by the band on the Ascension album, comes back to being the center of gravity. Anyway. “Naima,” “Ascension,” and “My Favorite Things” — the latter two segueing into each other via a tremendous Elvin Jones solo — made for a 40-minute block that I could use to work on other tasks, unobtruded, while legitimately spreading the word the way college radio is supposed to. I’d originally planned to let the CD continue into the 21-minute version of “Impressions,” but I was mentally ready to step back into DJ mode by then, so I decided to cut things short. I did one other thing on this show that I thought was cool. It’s customary for jazz radio hosts to celebrate musicians who have recently passed. In that spirit, and because R.E.M. had split up less than 24 hours earlier, I broke format for about 4 minutes to spin “Wolves, Lower,” off the Chronic Town EP from so very long ago. It was a celebration partly of my own youth and partly of the influence and effect R.E.M. had on college radio. They were part of the era that, for me, really defined what college radio is supposed to be, a spirit that’s fading fast. I hadn’t heard this song in years. Those four minutes meant a lot to me. Full playlist can be found in KZSU’s database, here. I stuck to Fo’s format, which is a wider spectrum of jazz than I play, so you’ll see a more accessible selection of music than on my normal playlists. 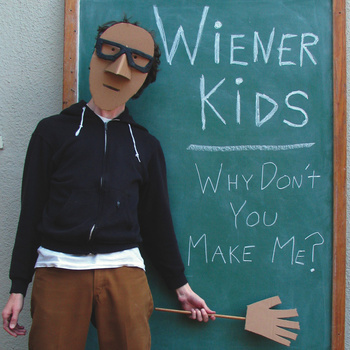 Wiener Kids will perform, with a 10-person expansion, at Subterranean Arthouse, Berkeley, on on Friday, Sept. 23, 9:00 p.m.
Good music continues to find a home at Berkeley’s Subterranean Arthouse (told ya). Friday, they’ll be hosting a CD release show for Wiener Kids, a trio being expanded to a 13-tet for the occasion. I went and bought their first trio album on Bandcamp as preparation. The band was just drummer Jordan Glenn and guitarist Steini Gunnarsson in its first phase, an apparently short period captured on the album, The Steini Year. (Great title.) Now Glenn has teamed with saxophonists Cory Wright and Aram Shelton for a decidedly jazzy sound documented on Why Don’t You Make Me? There’s a lot of goofing around, as if the album title and cover didn’t tip you off, but the band is a serious vehicle for Glenn’s irreverent compositional ideas. They just happen to be ideas open to some silliness. Not every track is funny, per se; the music is more like a sly, winking glance, like Groucho Marx breaking the fourth wall. But yeah, you have to like the bombastic tracks. “Nut Job” is based on a crazy, machine-like melody accented with raspy overblowing that just feeds the craziness. “Fruit Blasters” is downright jumpy and cartoony … and speaking of cartoony, “You’re a Baby Kozmo” has a playfully childlike riff that ends, again and again, with a ridiculously long baritone sax note. OK, that’s funny! It’s all hammed up, but you know, I can dig that in music. (See also Reptet and What Cheer? Brigade.) And plenty of free-jazz prowess shines through, to keep that part of your brain engaged. Utter seriousness does invade on one track, “Ballad of the Wee Dogs,” which even has Glenn playing some gentle, sad accordion. It’s got a European feel with a touch of the sad clown in it, and I don’t think it’s meant to be ironic. It was jarring at first, but on repeated listens, it’s not so out of place. All three members are all over the Bay Area creative-music scene, making Wiener Kids another of those ensembles that’s likely to surface only occasionally. And you’ll rarely see them with a 10-person add-on. Friday’s show promises to be unique and fun. Between work duties, parental duties, and a summer cold over the weekend, I’ve had little time for listening to music, let along blogging. I’m still here! Program note: I’ll be on the air for one extra week, so there’ll be a Memory Select show on Sept. 28, 9:00 a.m. to noon Pacific time. Bonus baseball, as they would say if this were, uh, baseball. John Carter & Bobby Bradford — “In the Vineyard” — Mosaic Select 3-CD box set (Mosaic, 2010; orig. recorded 1969) ….. I’d been meaning to blog about this box set but haven’t had the time to give it a thorough listen. It’s a document of L.A. free jazz circa 1970, and there’s some fantastic stuff in here. 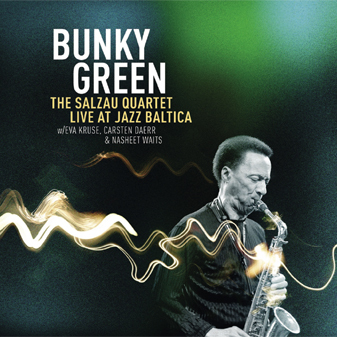 This track, like many others, features Carter’s sax/clarinet and Bradford’s trumpet in head-spinning unison lines and/or improvised interplay. Raphe Malik, Joe McPhee, and Donald Robinson — “Resolving a Quote” — Sympathy (Boxholder, 2004) ….. Dang, it’s been a while since I’ve listened to Malik. He can really spout on the trumpet. I’d bought this one on a whim not just on the strength of the two horn players, but on Robinson’s presence. His strong, light touch on the drums is a sound to be treasured. For the show’s final hour, I let myself depart strongly from jazz, into weirder experimental material. (etre) — “We Do Boring Things Together” — Inferno From My Occult Diary (Porter, 2011) ….. A one-(wo? )man artist doing collages of loops and sounds, with piano and acoustic guitar plentiful in the mix. I was worried this might slow things down too much, but this track got a caller, someone interested in tracking down a copy. Calls that that always make a college radio DJ’s day. Xela — [Side 2, excerpt] — Heirs of the Fire (SMTG, 2009) ….. On vinyl, an experimental piece in two side-long parts. I could have gone with the clamorous, stormy ending, all dark and almost gothy, but I liked the sounds at the beginning of this side, with chimes and wine-glasses and the feel of a cold metallic wind cutting through your soul. Anthony Davis — “Particle W” [excerpt] — Middle Passages (Gramavision, 1984) ….. A 16-minute piece for piano and tape, composed by Earl Howard. Quoting the liner notes: “The piano part consists of a set of detailed instructions which explain how to improvise each section. All the electronics for ‘Particle W’ were created on a Serge Modulator Music System.” Aside from the tape part here, Middle Passages is a solo piano album with a very classical-music seriousness. At the same time, it’s one of several Davis albums that KZSU owns from the ’80s, and the ‘fro he’s rocking with his conservative black suit is to die for. Claudi Scolari — “Movement Inspiration” — Colors of Red Island (Principal, 2011) ….. Interesting album that pains widescreen lyrical backdrops, as in the prettier albums on ECM, and puts almost rock drumming over them. Interesting combination, and closer to serene than bombastic. This track has some lingering Tangerine Dream moments before the vibes and crazy drums steop in; another track called “Variation of Movement” includes some strong trumpet playing over a very ECM-like backing. 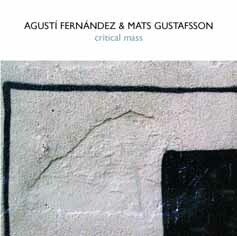 Agusti Fernandez and Mats Gustafsson — “Critical Mass 1” — Critical Mass (Psi, 2005) ….. The improv world is full of these arbitrary pairings, with so many recordings available that it’s easy for some to get lost or buried. This was a nice one to resurrect. Dark piano and prepared piano to go with Gustafsson’s punk sax attack. This track starts out all quiet and exploratory but later drags us through buzzy, noisy terrain. Cool. Branford Marsalis — “Xavier’s Lair” — Bloomington (Columbia, 1993) ….. Selected this one because we had tickets to give away for Branford’s Yoshi’s appearance (Sept. 21 in San Francisco). Branford’s isn’t a name associated with the avant-garde, but still. The polished precision (sometimes with unexpected twists buried inside long, fast scribbles), the quilted pillowy sound — there’s something to be said for all that. Eva, a KZSU DJ very into avant-garde music, reviewed this one for the station in the ’90s, noting Marsalis had talent and ideas but didn’t say that much, and I can see that argument. I also miss an element of rawness in the playing, as I noted on a review of mine for Footsteps of Our Fathers, where Marsalis covered an Ornette tune. Still, it’s good to be reminded that some of these big-name players really did do something to earn their names. Quite a few of the creative-music types on the Bay Area scene work with computers for a living. So, it was only a matter of time before someone came up with an app for the scene. It’s all yours for the low low price of $0. But wait, there’s more! Uh… no, actually there isn’t. But for $0, it’s a pretty good deal, eh? You can download the app at appshopper.com/utilities/transbay-calendar. I’m struggling to find room in my calendar for this year’s San Francisco Electronic Music Festival (which continues Sept. 9 through 11 at Brava Theater, 2781 24th Street, San Francisco). As I type this, I’ve already missed the Sept. 8 opening night at SF MoMA. Opening night would have been especially nice to see. Tom Djll and Tim Perkis played some tapes, found in a public radio vault, of old John Cage stories, accompanying them with a “Cage-appropriate soundtrack derived from the I Ching,” as the promo blurb put it. And Dina Emerson performed Milton Babbitt’s “Philomel,” a 1964 composition for soprano, recorded soprano, and synthesizer. It’s apparently his best known work. But, knowing as I did that I couldn’t make it to that show, I settled for buying a copy of the piece from eMusic. There’s plenty more to see and hear for the rest of the festival, which continues through Sunday, Sept. 11. Known quantities include Kevin Drumm and Christian Marclay. Among the folks you might not have heard of: the female quartet called 0Th (zeroth), whose album Tammy was well received by us at KZSU. A random snippet of what to expect: Oakland-based artist Greg Kowalsky plans to create a drone piece using a jew’s harp — not by plucking it as usual, but by subjecting it to a pulse wave generator. He’ll be performing in Sunday’s program.